Da Capo Press, 1997 . 260pp. $ $24.95. ISBN: 978-1885119438. 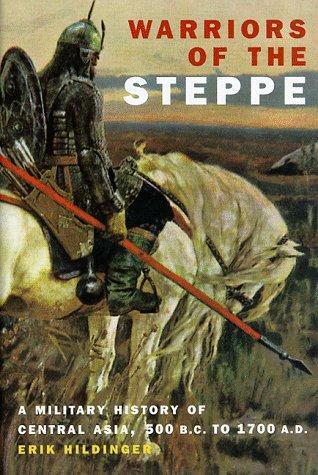 The greatest cavalry force in the medieval period was not the knight, but the steppe warrior. In Warriors of the Steppe, Erik Hildinger focuses on the nomadic steppe cultures and their peculiar method of war. Their environment and way of life was the key to their success against settled civilizations. The predominant method of war in the West was shock combat. This style of war proved futile because steppe warriors avoided direct confrontations. Rather, they employed feigned retreats with great effect and were able to shoot arrows with pinpoint accuracy from horseback. The steppe warriors picked off their enemies from afar and neutralized the knight without having to face the fury of a charge. Furthermore, steppe cultures, like the Mongols, assimilated and recruited conquered nations with ease. Genghis Khan and Timur Lenk perfected the multi-faceted strategy of “calculated terror” with astonishing results. However, the steppe warriors, like any other military group, were not invincible. The lack of a stable centralized state or governing body would prove their greatest weakness. Hildinger’s book is well written and filled with a plethora of information, especially in military terms, weapons, and organization. The steppe warriors were nomads, who moved from one settlement to the next to accommodate their pastoral means of subsistence. The steppe warrior’s natural proclivity for war springs from their peregrination: “War is therefore a natural consequence of successful nomadism and like any skill needed for survival it will be practiced to proficiency.” (p. 7) The steppe nomads were successful conquerors for many reasons including their unpredictability, large number of male recruits, the ability to illicit fear, and drill-like organization. Though the author shows throughout his narrative the importance of drill and maneuvers, he does not explore the subject beyond the scope of his paper thus squandering an opportunity to shed light on the sophistication of the Mongol training model. For an excellent discussion of Mongol drill and training, the interested reader should consult Timothy May’s recent work, which includes an excellent article on the subject. The Greek historian Herodotus was intimately acquainted with the earliest recorded group of steppe warriors: the Scythians and their cousins the Sarmatians. Herodotus first made the “distinction between the Western and steppe ways of warfare.” (p. 37) Their style of war was simple but effective: they never engaged the enemy preferring to remain just out of harm’s way, and, feigning retreat, drew their foe unwittingly into an ambush. Hildinger notes, “Steppe warfare at its purest is one of travel across great distance, missile warfare and, if it is advantageous, strategic retreat before the enemy until attrition, exhaustion or isolation have made his defeat inevitable.” (p. 39) The example of Crassus’ defeat at Carrhae illustrates the effectiveness of feigned retreats and the ability to neutralize opponents from a distance. Another tactic employed by other Barbarian tribes in Eastern Europe was encircling the enemy. Feigned retreats, drawing the enemy out, encirclement, and horse archers would be employed time and again by all steppe cultures with devastating effect. The Huns were unusual in that they were both allies and enemies of the Roman Empire. It was commonplace to see Huns and various barbarian tribes as auxiliary units in the legions. They were opportunists who sought to exploit any given situation in their favor. They were also different from other steppe people in that they made regular use of the lasso as a weapon. They were strongest under the leadership of Attila and did not suffer defeat until they met an uneasy alliance between barbarians and Romans in a pitched battle in Gaul. When Attila died, the Huns, like most steppe people, dispersed and were no longer a threat. The Avars, Bulgars, and Magyars moved into the region once occupied by the Huns. It was the Avars who first introduced the stirrup to the Western world. The stirrup enabled mounted steppe warriors to wield lances much like the Western knight. Hildinger rightly observes the lance was not usually used in a couched position but wielded as a striking instrument. As evidence to support his view, he cites the pictorial scenes from the Bayeux Tapestry, a marvelous work of immense value to military historians. Charlemagne insured that the Avars threatened his borders no more and in 786 brought them under his yoke. The Bulgars, who posed little threat (once they accepted Christianity, adopted the Slavic language, and quietly assimilated with their neighbors), followed the Avars. However, the same could not be said of the Magyars. They were used as mercenaries by the Byzantines and Germans and wound up with Hungary. From there, they launched raids into Italy where steppe tactics were unknown. They employed feigned retreats with great success. To curb the continued encroachments of the Magyars, Otto I annihilated them at Lechfeld in 955. The survivors were assimilated into the local populace. Assimilation of various Barbarian cultures into larger, more powerful Barbarian tribes and confederations was common practice in early medieval Europe. Patrick Geary examines the changing ethnic composition of Central and Eastern Europe throughout the medieval period in his book The Myth of Nations: The Medieval Origins of Europe (Princeton Univ. Press, 2003). The section on the Seljuk Turks discussed the Battle of Manzikert and the Turkish presence in the Holy Land against the Crusaders. Hildinger’s narrative is missing the necessary background and contextual information to situate Manzikert in its proper perspective, leaving the reader to mistakenly believe that Manzikert was a pivotal battle. As others have pointed out, the real threat was a combination of poor decisions by the Emperor Romanus IV Diogenes. While Hildinger’s analysis of the battle is basically correct, he does not bring the reader’s attention to the true culprit – a series of strategic and tactical mistakes that led to the collapse of Byzantine influence in Asia Minor, a blow they would never recover from. Political intrigue and instability in the capital coupled with an army that consisted of more mercenaries than loyal Byzantines were concomitants but they were of secondary importance. Had Romanus made wiser decisions in planning and execution his campaign, it is possible that the outcome, even with betrayal by a rival, could have been different. A second battle, the Battle of Hattin, is discussed at length but it, too, is little more than a brief restatement of Charles Oman’s treatment in A History of the Art of War. Oman’s discussion is more valuable in its analysis; however, Hildinger calls attention to the Crusaders inability to regroup after the initial charge into the enemy. The steppe warriors, notes Hildinger, were conditioned to automatically regroup after a charge. This gave them an edge in battle. Hildinger concludes, “Knights were not true cavalry in spite of superficial resemblances.” (p. 99) Such a casual dismissal of the knights’ and his blatant disdain for their martial abilities is peculiar. Furthermore, he does not seek to qualify the statement that ends his discussion in a rather awkward manner. Hildinger describes Genghis Khan as an astute ruler who understood the transitory lifespan of steppe regimes and had the foresight to plan against the dissolution of his hard-fought gains. In order to do this, Genghis Khan assimilated conquered peoples into the Mongol tribe, which would, as Hildinger notes, “form a new artificial nation called the Mongols.” (p. 118) He rewarded loyalty with positions of favor and filled his army with men devoted to him. Settled populations, especially those in fortified cities, were difficult to conquer but incursions into China held the answer. In China, Genghis discovered the art of siege. Chinese engineers would prove to be Genghis’ secret weapon against all who lived in fortified cities. Furthermore, Genghis would use another tactic repeatedly with great effect: terror. Sieges were used to take fortified positions while the “calculated use of terror” was used to demoralize any who thought to defy the Mongols (p. 129). The Mongols continued to push further west and conquered the area of southern Russia in short order. They continued into Central Europe where they wrecked havoc over the region, defeating one enemy after another. An unforeseen event, the death of the Great Khan Occodai, brought a welcome relief to the beleaguered Hungarians and to Europe in general. The Mongols returned to Central Asia for the election of a new khan. Europe narrowly escaped becoming a Mongol dominion. War against fellow believers is frowned upon in the Koran. This led to the emergence of a trained military class of slaves called Mamluks used for the sole purpose of waging war against fellow Muslims. They were to become the elite guard, the crème de la crème of the army. They were highly trained in a way reminiscent of strict Roman discipline using furusiya manuals. “Furusiya refers to the skills to be mastered by mounted soldiers”, according to Hildinger, “and these textbooks set out drill and instruction in the necessary skills for the Mamluks.” (p. 154) Polo was a sport conceived to “help cavalrymen hone their horsemanship and it requires useful skills.” (p. 156) This was an excellent opportunity to discuss the virtues of the royal hunt in developing cavalry skills of the Mongols, but it is likely that the author was unaware of the connection. Hildinger, however, expertly discusses the varying styles of tilting, or lance techniques, and their efficacy against the western knight. The Battle of Ayn Jalut is memorable in that the Mamluks were able to repulse repeated Mongol attacks. The key to Mamluk success was a similar fighting style that was “perfected” juxtaposed with capable leadership (p. 166). The Crimean Tatars, like their better-known cousins, employed the same style of war. They relied upon cavalry and steppe tactics to frustrate and defeat their enemies. Unlike other steppe cultures, the Tatars preferred campaigning in winter because the snow protected the hooves of their mounts and frozen rivers allowed easy access. A specific type of booty that brought a handsome return was slaves; many of the women captured were shipped to India and throughout the Turkish Empire. Hildinger, in detail, outlines the organization of Tatar raiding parties. Tatar opportunism meant that they were averse to meeting an enemy in a pitched battle unless they clearly had the advantage. By the advent of Catherine the Great’s reign, the supremacy enjoyed by the steppe warriors had come to an end. The Manchu dynasty was founded by Nurhachi, a man who consolidated power in a way reminiscent of Genghis Khan. Nurhachi was a seasoned practitioner of war who used every trick available to win. Often times, he took great gambles. However, with great risk comes the opportunity for great reward. In one incident, he sent Chinese deserters to a loyal Chinese army in order to sow discord amongst its officers and create the illusion of defeat. The ruse worked because Nurhachi was committed to see it through and knew that his own life hung in the balance. Nurhachi achieved success against the Chinese because they were plagued by intrigue and internal division. They were more concerned with Chinese politics than Nurhachi’s barbarians on the frontier. While troops were sent to garrison the frontier, they were sent gradually. The greatest threat against the Chinese was not the Manchus, but themselves. The Manchus merely capitalized on a weakened Chinese state as any opportunist would. Hildinger concludes, and rightly so, that Manchu success against the Chinese is due in part to their limited holdings abroad and their concentrated efforts against a single enemy. Most steppe warrior cultures were experts in the calculated use of terror. This term is used frequently by Hildinger to describe the psychological impact associated with these warrior cultures. “The Mongols knew the value of calculated terror; as a campaign progressed, more and more cities and towns would surrender to them without a fight.” (p. 13) This tactic was used consistently for two reasons: it provided a domino effect of capitulation throughout a region and it preserved the army’s men and mounts for more obstinate foes. The Mongols were the foremost practitioners of this style of war. “Terror had become an effective tool—purposeful terror could be just as useful as siegecraft, and caused fewer Mongol losses.” (p. 128) Another powerful figure who utilized terror to conduct military conquests was Timur Lenk. He first used this tactic against the King of Khwarezim at Urgench. Twice Timur offered terms and twice he was refused. After he had taken the city, he massacred most of the populace and enslaved the rest. Syria felt the unrestrained fury of Timur’s terror. The eyewitness accounts of a Spanish ambassador portray the region in vivid detail with much of the countryside littered with towers composed of men’s heads. “These grisly structures were built from the remains of thousands of Aya Qunlu Turkmen whom Timur had conquered and resettled in Syria…. Clearly Timur’s efforts at terror had worked successfully in this area.” (p. 184) A modern comparison can be made with Stalin’s reign of Terror in the 1930s and 1940s. Terror was a proven method that ensured an opponent’s defeat without ever having to face them in battle. It was a cheap and effective tool to stamp out opposition and consolidate power. Though Hildinger is fond of using military maxims of some notable military personalities including Napoleon and von Clausewitz, Sun Tzu would have been most impressed with the idea of calculated terror. The source material consulted by the author is broad but selective and includes findings from other disciplines, including archaeology. He is well versed in the archaeology record of the steppe and its current state, and although archaeology is often ignored in other works, Hildinger predicates his assumptions, conclusions, and reconstructions upon archaeological evidence. For this reason, Hildinger’s analysis and the conclusions drawn from this illuminating discipline are much more credible in his reconstructions. For example, Hildinger used archaeological evidence to dispel two myths concerning the Huns: they neither used stirrups nor buried their dead with operational recurved composite bows (pp. 19 and 23). Archaeological evidence, however, is found wanting in respect to the Mamluks, Crimean Tatars, and Manchus. Hildinger’s use of archaeology is juxtaposed with convincing eyewitness accounts and authoritative secondary sources. This reviewer was particularly impressed with Hildinger’s familiarity with Vegetius, Maurice, and Princess Anna Comnena, in no small part due to his undergraduate education in the classics. Hildinger alludes to vassalage as a practice often employed amongst steppe cultures. In his section on the Mongols, Hildinger mentions that Toghrul, a Mongol chief, “was a vassal of the Chinese and therefore commonly received gifts from them which, as khan, he was expected to divide among his noyans.” (p. 113) The Turks, under Timur Lenk, practiced a form of feudal tenure called iqta. “The land was to support them while they in turn were to provide military service. Their system resembled the feudal arrangements of a knight, and the sipahis were obliged to supply a number of cavalry commensurate with the value of the land they held (p. 188-89).” On the surface there are some similarities between iqta, timar, and feudalism but there are more substantial differences that the author chooses to ignore. It is reasonable to suggest, however, that feudal principles, such as vassalage and tenure, were adopted and implemented as a system in the East from the West courtesy of the Crusaders, but there are historians who vehemently oppose such a view. Mark Bartusis persuasively argues that there was no feudal connection between West and East. Bartusis shatters Ostrogorsky’s feudal thesis in the East and demonstrates that the Byzantine pronoia shared a closer affinity to the Ottoman iqta and timar than to the Western construct of feudalism. The warriors of the steppe were an unstoppable force. Their dominance ended from a lack of centralized governance and their inability to settle down. This can be attributed in large part to their shared experiences rooted in a heritage of pastoralism and nomadism. They were expert on the horse and could handle a bow, riding at full gallop, with ease. Mobility and steppe tactics ensured that they would exhaust their opponents before they would engage, preferring to pick them off from afar with a shower of arrows. From the Scythians and Sarmatians to the Crimean Tatars and Manchus, the steppe warrior modus operandi experienced little change. This was their great strength. They possessed unmatched mobility covering vast distances quickly. They were natural horsemen who cultivated the art of war from atop their mounts. They were a tough, resilient people who, like the Western knight, faded from history with the arrival of new technology that made the steppe warrior obsolete. Timothy May, “The Training of an Inner Asian Nomad Army in the Pre-Modern World,” The Journal of Military History 70.3 (2006): 617-635. Edward Luttwak, The Grand Strategy of the Byzantine Empire (Cambridge: Belknap Press, 2009), pp. 162, and 221-229. Thomas Allsen, The Royal Hunt in Eurasian History (Philadelphia: Univ. of Pennsylvania Press, 2006).